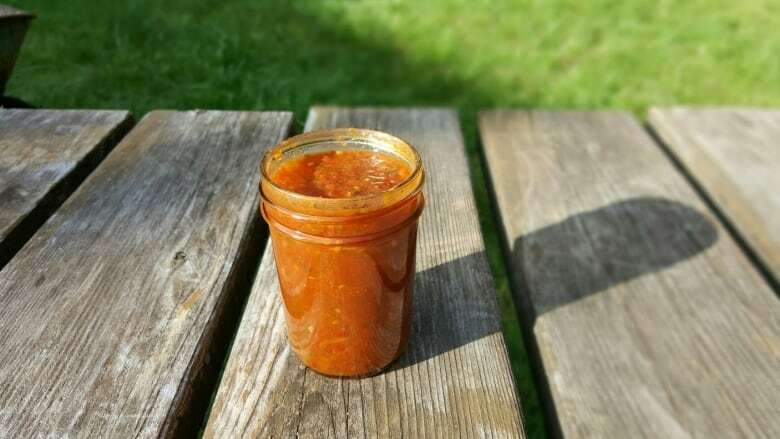 If you want to enjoy summer and fall flavours all year round - like salsa, for instance - canning is one of the best ways to do it, and D is for Dinner shows you how. Winter is quickly approaching, but if you want to enjoy summer and fall flavours all year round, canning is one of the best ways to do it. Sara Pishva is the chef and owner of Top Shelf Preserves, and sells her pickles and preserves at farmers' markets and retailers around the city. Today on D is for Dinner on CBC Radio's All In A Day, she shares a recipe for something you can't buy: her go-to tomato salsa. It's heavily influenced by a recipe by canning experts Bernardin, but as Pishva says, feel free to adjust the recipe to bring out the flavours you like. 7 cups chopped tomatoes (or about 7-8 medium-large tomatoes). 2 cups coarsely chopped onions. 1 cup coarsely chopped green pepper. One 156 ml can of tomato paste. ½ cup chopped cilantro, lightly packed. Place five clean 500 ml mason jars on a rack in a boiling water canner; cover jars with water and heat to a simmer (180°F/82°C). Take five mason jar lids. Set the metal screw bands aside and heat the sealing discs in hot water, not boiling (180°F/82°C). Keep both the jars and sealing discs hot until ready to use. Blanch, peel, seed and coarsely chop tomatoes. Wearing rubber gloves, remove seeds and finely chop jalapeno. Combine tomatoes, onions, green pepper, jalapeno, garlic, tomato paste, vinegar, cilantro and cumin in a large stainless steel saucepan. Bring to a boil; boil gently, stirring occasionally, until salsa reaches desired consistency — about 30 minutes. Ladle the salsa into a hot jar, leaving about 1 cm of headspace. Using a nonmetallic utensil, remove any air bubbles and adjust headspace, if required, by adding more salsa. Wipe the jar's rim to remove any food residue. Centre the still-hot sealing disc on the clean jar rim. Screw band down until tight. Return the filled salsa jar to the rack in the canner, and repeat for the remaining salsa. Once the canner is filled, ensure that all jars are covered by at least 2.5 cm of water. Cover canner and bring water to a full rolling boil before starting to measure the processing time — 20 minutes for altitudes up to 1000 feet. After 20 minutes of boiling, remove the canner lid, wait 5 minutes, then remove jars without tilting and place them upright on a protected work surface. Cool in an upright, undisturbed position for 24 hours. Do not retighten the bands during this time. After 24 hours of cooling, check the jar seals. Sealed discs curve downward and do not move when they're pressed. Remove the bands and wipe and dry both the bands and jars. Store screw bands separately or replace loosely on jars, as desired. Label and store jars in a cool, dark place. For best quality, use homemade canned foods within one year. Make a plan. Who is going to eat all the preserves you're making? Think about how many jars you will reasonably go through in a year, and how many jars you plan to give away as gifts. It's a good idea to start small with your first recipe. ​Give yourself enough time. Timing can be critical when canning, so make sure you block off enough time so you're not rushed to finish. Give yourself an extra hour or two, and consider enlisting some people to help out. Taste what you're preserving as you make it. If you don't like it now, you probably won't enjoy it in six months! Taste for seasoning and make sure whatever you're making isn't burnt. You can always add or reduce salt or sugar in a water bath canning recipe, but don't reduce the acid in a recipe (though you can increase it as you like). Take notes. If you liked a recipe, if it was easy, or if the yield differed from the recipe, make a note of it. If it was too spicy, sweet, or salty, note that too, so you can adjust the recipe next time to suit your tastes. Label your preserves. ​Especially if you are giving the jars away, it's important to write what's in the jar and the year you made it.